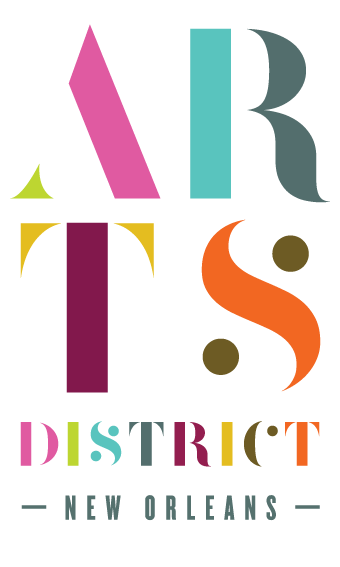 On August 5, from 5:30 to 9:30 p.m., the art galleries located along the 300-700 block stretch of Julia Street will open their doors to let the art, food, music, whimsey and wine flow freely into the street. Whitney White Linen Night was originally devised and organized by Arts District of New Orleans as a means of attracting art enthusiasts and others to the downtown galleries during the slow early summer months (the event is now planned and organized by the Contemporary Arts Center). Whether at the intersection of St. Bernard Avenue and Gentilly Boulevard or the riverside path along the Moonwalk, if you’ve walked the streets of New Orleans, you’ve already come face to face with the works of John T. Scott. His vibrantly colored paintings and meticulously crafted yet raw sculptures hold prominent place both in outdoor public spaces, such as those at De Saix Circle and Woldenberg Park, and prominently displayed in institutions of art and learning, such as those in the Louisiana Humanities Center, New Orleans Museum of Art and the Ogden Museum of Southern Art. The exhibit opens on August 5 and will be on view until September 23. Also on display at Arthur Roger Gallery (next door at 434 Julia St.) is “Dapper” Bruce Lafitte. Lafitte, who was born Bruce Washington in 1972, grew up in the former Lafitte housing development in the 6th Ward. Lafitte’s vividly colored drawings focus on documenting the vibrancy and ceremony of the New Orleans marching band culture, in addition to exploring issues of race and poverty. Lafitte is a self-taught artist whose works have been displayed in galleries and museums in New Orleans and New York for years. The exhibit opens on August 5 and will be on view until September 23. Art Knows No Boundaries: Cuban Art in the U.S. at Octavia Gallery brings together a mix of photography, paintings and sculpture works from ten Cuban artists. These artists works will engage audiences in a conversation about the idea of borders and the economic, social and the political states of Cuba, touching on issues concerning accessibility of public and private spaces, capitalism, hierarchal structures, race and privilege, religion and status. The ten artists featured in this exhibition are Alexandre Arrechea; Neisys González; Roberto Diago; Alex Hernández Dueñas; José Emilio Fuentes Fonseca (JEFF); Kcho (Alexis Leyva Machado); The Merger (Alain Pino Hernandez, Mario Miguel González Fernandez, and Niels Moleiro Luis); and Adislén Reyes. The exhibit will be on view from August 5 to September 30. Originally conceived as an installation in the Abyssinian Meeting House in Portland, Maine, which is the third-oldest African-American meeting house in the United States and the first of two sites in Maine to be recognized by the National Park Service as part of the National Underground Railroad Network to Freedom (the other is Harriet Beecher Stowe House in Brunswick), Daniel Minter’s A Distant Holla is a celebration of African-American legacy and ancestry. With a showing of new and retrospective works spanning 30 years, Minter’s exhibition will take audiences on a journey of African spirituality and the experiences of the African diaspora through a combination of paintings, carvings, assemblage and installation works. The exhibit will also feature a functioning ancestor altar and a live drumming performance. The exhibit will be on view until August 30. 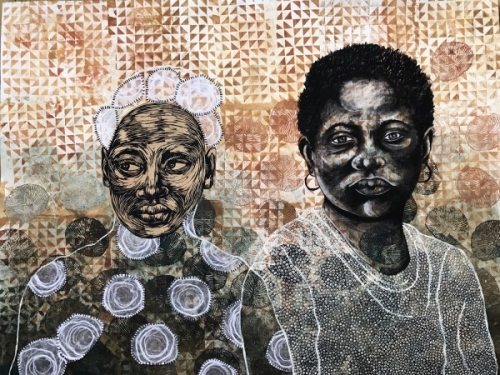 As thought-provoking as they are visually-striking, the print works of Delita Martin on display at Stella Jones Gallery will captivate the eyes and the soul. The exhibit will be on view until September. Jazz trumpeter Mario Abney will also be on site performing. The New Orleans Chapter of The Links, Incorporated will present its Historically Black College and Universities (HBCU) Arts Showcase. The exhibition will feature works from Xavier University of Louisiana and Dillard University students. Chartered in 1957, supporting the arts is one of the National Program Facets supported by the chapter along with Services to Youth; International Trends and Services; National Trends and Services; and Health and Human Services. The exhibit opens on August 5 and will be on view until October 8. In addition to the HBCU Showcase, also on display at the Ogden is Louisiana Contemporary, the annual exhibition that opens each year during White Linen Night. The exhibit will feature an assortment of living Louisiana artists. The statewide exhibition, established in 2012, is a juried exhibition that promotes contemporary art practices in the state of Louisiana. The 2017 juror for Louisiana Contemporary is curator and researcher Shantrelle P. Lewis, creator of The Dandy Lion Project. The exhibit will feature 84 artists, including Luis Cruz Azaceta, Kristen Downing, L. Kasimu Harris, Ana Hernandez and Jose Torres-Tama. For a full list of the 2017 Louisiana Contemporary featured artists, visit www.ogdenmuseum.org/exhibition/louisiana-contemporary-presented-helis-foundation. Louisiana Contemporary is presented by The Helis Foundation, and will be on view from August 5 until October 15. In celebration of New Orleans’ upcoming Tricentennial, the Contemporary Arts Center is opening Ephemera Obscura, a multi-artist exhibition examining the relationship of objects to places, how their experienced and cultural identity. The annual exhibition will present the works 34 regional artists, such as Jose Cotto, Nurhan Gokturk, Juliana Kasumu, Sara Madandar, Carlos Rolón/Dzine and Lorna Williams. For a full list of “Ephemera Obscura” featured artists, visit www.cacno.org/ephemera-obscura. Ephemera Obscura opens on August 5 and will be on view until October 1. Though it’s not officially a part of Whitney White Linen Night and definitely not situated on Julia Street, another show worth the visit is “Pride of Place: The Making of Contemporary Art in New Orleans.” This exhibit brings together the personal art collection of Arthur Roger, which was recently donated to NOMA for its permanent collection. The exhibit is a showcasing of the rise of contemporary art in New Orleans and comprises works collected by Roger dating back to the 1970s. The exhibit is currently on view at NOMA and will be on view until September 3. In addition to Ephemera Obscura, the Contemporary Arts Center will host the annual official White Linen Night after party from 9 p.m. to midnight. Admission is free to CAC members; general admission is $10 for non-members. 504ward is hosting it’s annual party during White Linen Night from 6-9 p.m. at the Louisiana Children’s Museum (420 Julia Street). Admission to the event is $45 with proceeds benefitting the Contemporary Arts Center. Tickets can be purchased online at www.eventbrite.com/e/504ward-white-linen-night-connections-party-tickets-33794404975. Patrons must be at least 21 years old to attend. White Linen Night is free and open to the public. For a complete list of participating White Linen Night galleries, bars and restaurants, visit www.cacno.org/wwln2017.